Peterborough Phantoms sit proudly on top of the English Premier League after surviving their own scare on a night of upsets. 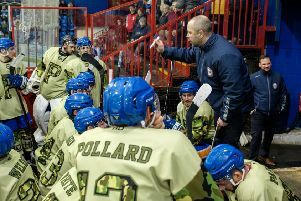 Coach Slava Koulikov was the first to admit that it was hardly a vintage performance which carried his men to the summit as they made hard work of seeing off struggling Sheffield Steeldogs at Planet Ice last night (November 15). Phantoms were well short of their best and eventually required an empty-net strike from Marc Levers in the dying seconds to clinch a 6-4 success in their only outing of the weekend. They had previously got on top with a spell of four goals in the space of six minutes and six seconds in the second period. The outcome proved enough to lift them into pole position after shock results in the games involving the two teams who went into yesterday’s fixtures above them. Previous leaders Basingstoke tumbled in a top-versus-bottom clash at Hull while Milton Keynes, who occupied second spot, were thumped at second-bottom Bracknell. But Phantoms, who hit the ice in third place, ensured their names were not added to the list of slip-ups against the third-bottom Steeldogs. It means they now set the pace from Basingstoke by virtue of a superior head-to-head record. They also boast two games in hand on the Bison and have played four fewer matches than MK, who sit a point back in third. Koulikov said: “We didn’t play as well as we can by any means, but we know the reasons why. We had some tough practice sessions last Thursday and Friday which showed on the ice as we were sluggish. “I would probably have been angry after this standard of performance in a normal weekend, but we felt we had to put the hard work in ahead of only one game this weekend and in the next two weekends. Koulikov’s pre-match prediction of a fresh approach from Sheffield proved correct. Eleven minutes had passed before there was even a hint of niggle and the gloves were not dropped once – both almost certainly records for games against these opponents. The Steeldogs’ performance was refreshing on the whole and impressive in parts as they provided a stern test for Phantoms. But, even when not playing well, the city side possess the devastating quality required to win games. They had twice trailed prior to that match-changing scoring salvo though as Ashley Calvert’s effort in the opening session and Stan Lascek’s strike less than two minutes into the middle period handed the Steeldogs advantages. The first of those was cancelled out by a well-worked Will Weldon goal before an off-balance and falling Levers provided the second equaliser when triggering the key spell in the contest. Weldon then put Phantoms ahead for the first time when gobbling up his own rebound after fine work round the back of the net from Craig Scott before two strikes in 40 seconds stretched their advantage. Edgars Bebris’ back-hander against old club on a delayed penalty and captain James Ferrara’s cool finish were split only be a Sheffield team-talk. Presumably conceding again wasn’t the immediate instruction from the visiting bench. Sheffield did provide a constant threat though with imports Arnoldas Bosas and Lubomir Korhon particularly dangerous and only a series of fine Janis Auzins saves preserved Phantoms’ advantage. There was no change to the scoreline until the closing stages as Lithuanian ace Bosas pulled a goal back with just under three minutes remaining. Steeldogs’ response was to pull netminder Dalibor Sedlar with 1:43 still on the clock and they were rewarded with another goal as Auzins’ attempted clearance was charged down and converted by Korhon. But a brief Phantoms panic was ended when Levers steered his second goal of the evening into the empty net with 45 seconds to go to clinch their rise into pole position. They will find it tough to stay there as they continue a run of three successive weekends with only one fixture. Their next outing is a trip to Deeside to take on Manchester on Sunday.